And you thought I was finished blogging? Rarely to a miss a chance to rant about beer. The beer list from GCBF this year is out and has quite a few gems. This year I thought about doing a Top Ten list of the beers that I am looking forward to trying and perhaps a few items people may have overlooked. There will also be a few duds this year. It is a rant by the Victoria beer prick right? 10. Axe and Barrel's Fruity Mother Pucker. This is a great name for a kettle sour, but it is not original. Peaks in Port Angeles made a kettle sour, but they mentioned that it was not intentional. Will be nice to see how Andrew's favourite kettle sour tastes in his new place. 9. KPU beers. This is the Kwantlen Polytech University brewing program. They picked a few classic styles like a Schwarbier (black) and an altbier (lagered dark ale). 8. Unibroue - Ephemere this year is a elderflower and fruit. Should be tasty. 7. Faculty brewing's 713 Balsamic stout. Balsamic reduction in an oaked stout. Could be good or really bad, certainly worth a token. 6. Beau's Gruit Ale. A gruit is a beer bittered with herbs and not hops. The Buenos Dias sounds like a salty Gose with citrus additions. 5. VIB - They will be releasing two new beers at GCBF this year. Hopefully they are truly new and not remixes of old beers or Corona clones. Their beers are usually solid and token worthy. 4. Category 12 - They seem to have an interesting selection of new beers and casks. Zombie 2 and brett pale ale here I come. Swan's should also get a nod here too. Swan's Black Chamomile Pils sounds interesting. 3. All the new breweries and Vancouver tasting lounge breweries. There are too many to list. Many of them are too far away to reach Victoria or volume is too small to warrant the ferry cost. In no particular order: Luppolo, A-Frame, Mount Arrowsmith, SOOKE!, Ravens, Hathi, Riot Brewing, Andina Kolsch, WhiteTooth. 2. Field House's Coolship! 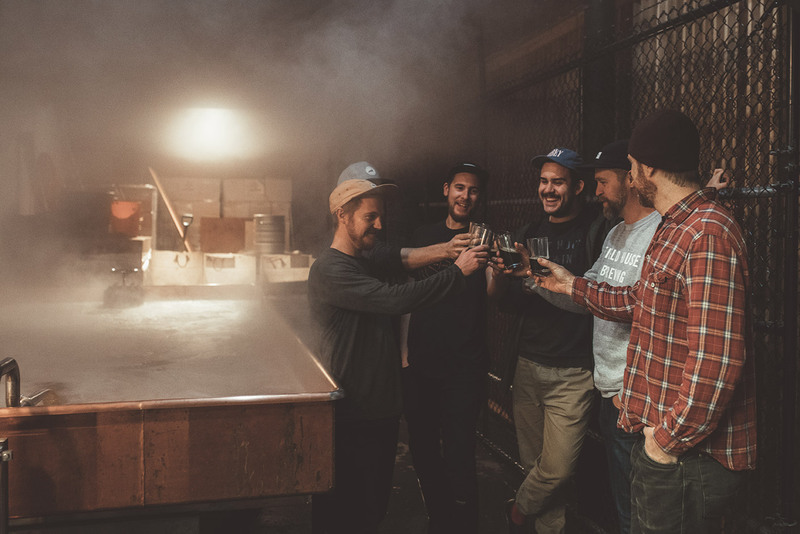 A coolship is an open fermentation vessel which allows wild yeast and bacteria from the environment to land on the cooling beer and assist in fermentation. True terroir! These beers and generally a bit on the sour and funky side and always one of a kind. This is where I will be lining up. 1. Drake Cask Tent! I wonder why the Drake Eatery and Beer Parlour (at 517 Pandora) has it's own booth at GCBF? Sorry, inside joke. There is no mention if these 13 casks will be tapped at the same time, or if they will be staggered throughout the weekend. We will have to find out on the day. There are a few honourable mentions, but I ran out of space. Fuggles and Warlock G&T Peach sour, Four Winds Quadrennial, Moon's kettle sour, Steel and Oak Steinbier (heated stone beer in collaboration with Freigeist Bierjultur), Trading Post tart cranberry brett ale and Strange Fellows Popinjay New World sour. Again, I feel disheartened by lack luster effort from local breweries in their choice of beers to showcase at an event that garners so much attention. They have the shortest travel distance. C12 has some new items, even VIB timed beer releases well. Driftwood core brands and cask of strong seasonals (didn't they do this last year? ), Phillips ditto (although their Cola Slipstream sounds interesting) , Spins ditto, Hoyne ditto (their cask sounds suspiciously like Dark Matter with blackberries), Twa Dogs only current mixer pack, Lighthouse 3rd beer not mentioned. Canoe only core brands. Special mention to Granville Island for the best written description of their beers, but weren't these the same beers as last year? Then again, there will be people new to craft beer and this is the perfect place for them to sample regular brewery offerings. Maybe I am being overly critical. Irregardless, it will be a great weekend of great beers hosted by great volunteers and fed by great local food trucks. Hopefully the washroom line ups will be shorter this year. What do you think, leave comments below.